The AfDB has expressed its reluctance in a statement regarding Mauritania's objective of providing drinking water to 80% of the population before the end of 2018. The bank mentions, among other things, the poor quality of the water distribution system. The African Development Bank (AfDB) recognises that Mauritania’s efforts to overcome drinking water shortages are considerable. However, the bank has doubts about the ability of this North African country to ensure access to drinking water for 80% of its 4.3 million inhabitants by the end of 2018. “A very significant effort is still needed,” says El Faleh Jalel, a hydraulic engineer at the AfDB, in a statement dated November 28, 2018. Mauritania’s daily drinking water needs are estimated at 100,000 m3, while national production is around 55,000 m3 per day, supplied by the only available water table in Trarza (southwestern Mauritania). According to El Faleh Jalel, sustainable access to water for the populations of Nouakchott, the capital, remains limited due to the lack of an adequate distribution system. Water pipes have many leaks, which cause service disruptions in some lower areas of the city. As a result, only 68% of the population has access to water (for an average consumption of less than 50 litres per day per person). In rural areas, drinking water shortages are more recurrent and more acute. This is due to the decrease in rainfall, as well as the insufficient technical and financial capacity of the Mauritanian National Office for Rural Water Services (Onser), which is responsible for supplying water to more than 800 rural centres. Unable to withstand such conditions, some inhabitants migrate to the cities. The work already carried out and still in progress in Mauritania allows the AfDB to be confident about the country’s objectives in terms of access to drinking water for the population. 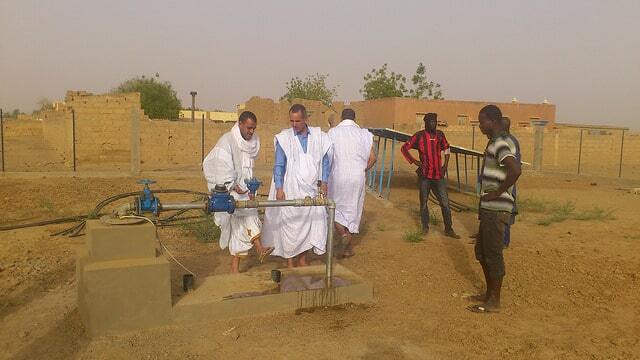 “The main performance indicators of the sector show that the objective of ensuring access to drinking water for 100% of the population by 2020 is possible, and the 2030 deadline is possible if Mauritania, with the support of its technical and financial partners, manages to implement the necessary projects and programmes.” Said El Faleh Jalel. For its part, the AfDB invested US$ 45.7 million in Mauritanian water supply and sanitation projects between 2003 and 2014. This enabled a total of 180,000 people, spread over 450 villages in the M’bout, Monguel and Barkéol areas (all in the south of the country), to see drinking water flowing from their taps.